Sabudanna pakoda is a crispy, crunchy and mouthwatering snack. It is crispy from outside and soft and chewy from inside. This sabudana pakoda is usually made during the vrat or upvaas like Navratri fast, ekadasi, maha shivratri, janmashtami, gauri vrat or Shravan maas upvaas. But this recipe is not restricted to this fasting days. Soak the sabudana in enough water overnight or for 4-5 hours. Drain and keep aside in a mixing bowl.Boil the potatoes, peel and chop roughly. Roast the peanuts in a pan till browned and crisp. In a mortar-pestle, coarsely crush the roasted peanuts. add all ingredients to the drained sabudana, including the chopped potatoes and peanuts. Mix well. Check the taste and add more salt or sugar if required. Heat oil in a kadai or pan. Make small balls with your hands or using a spoon drop the mixture in to medium hot oil. Let the pakoras become opaque and then turn them with a slotted spoon. Deep fry till the sabudana pakoras become light golden and crisp. Drain the pakoras on paper napkins to remove excess oil. 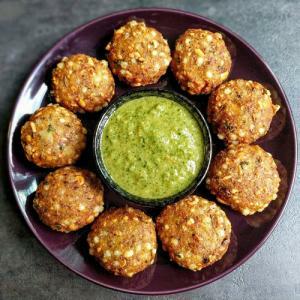 Serve sabudana pakoras hot with tomato sauce or green chutney or coconut chutney. if you are making these sabudana pakoras for fasting then serve them with phalahari chutney.